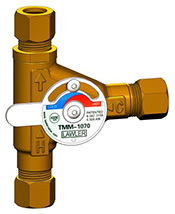 Lawler’s TMM-1070® thermostatic mechanical mixing valve provides a basic solution for mixing hot and cold water at the point-of-use and features a high temperature limit stop designed to shut down water flow above 120°F. 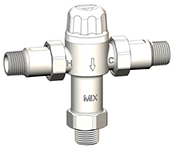 This small Type T valve (3/8" compression fitting) is used for under-the-counter applications such as hand lavs, electronic, sensor, and metering faucets. 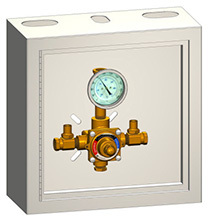 Integral rubber duck-bill back-flow checks are included within inlets. Temperature adjustments are made by simply turning a dial; clockwise for lowering outlet temperature and counterclockwise for raising outlet temperature. 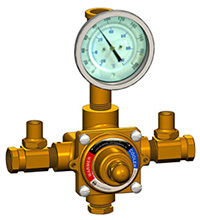 For maximum safety, the valve cannot be adjusted above its shut-off temperature (120°F). 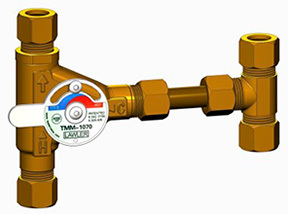 Lawler’s 310® thermostatic mixing valve (Type T) meets your specification for a small (1/2" NPT) under-the-counter master controller for individual or multiple fixtures at point-of-use. The Model 310® contains a highly sensitive thermostatic element that automatically responds to temperature and pressure variations in hot and cold water lines. The stainless steel piston and liner precisely proportion water flow to maintain a constant outlet temperature and to guard against unexpected hot or cold water spikes. For higher capacity needs, the Model 310® is available with a 3/4" NPT outlet. 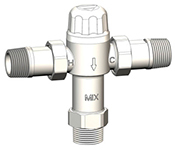 Model 310® precisely controls outlet temperatures to within ±3o with flow rates of .5 to 7 GPM or .5 to 12 GPM at 45 psi (based on your choice of outlet piping size). The Model 310® can be installed with or without cabinet.